If you are on the hunt for a new tool bag, you may want to check out the XtremepowerUS 18" Rolling Tool Bag, a really sleek, modern, and useful option to consider. It has more than enough room for all of your tools, it’s very durable and well built, plus of course you don’t even have to carry it! It’s one of those things that can help make your life a whole lot easier at the end of the day. There is really nothing bad to say in terms of safety here, double zippers, straps, and a water resistant lining help keep your tools safe at all times. The value for the money here is pretty good. It is a really good rolling tool bag, but there are others of a similar quality for a lower cost. The overall build quality of the XtremepowerUS 18" Rolling Tool Bag is very good. It is a very durable and well-constructed rolling tool bag with only a couple of minor issues concerning the interior pockets. The XtremepowerUS 18" Rolling Tool Bag is a very new and modern version of your good old tool bag. Tool bags have been around for a long time, and so have rolling suitcases. Now you have the best of both worlds right here. 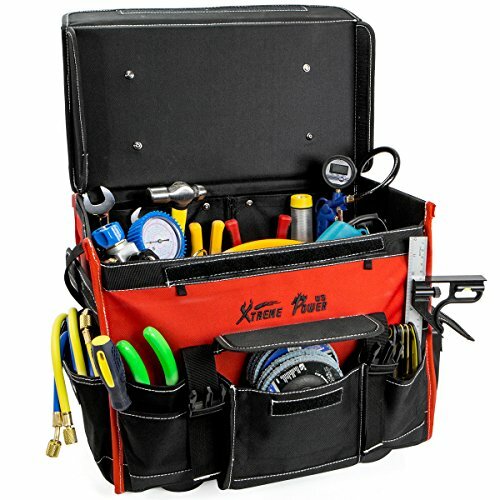 The XtremepowerUS 18" Rolling Tool Bag is ideal for any contractor, plumber, handyman, and general laborer that needs a good place to store tools but doesn’t want to carry them around. A rolling tool bag is always a nice thing to have when you have potentially hundreds of pounds of tools that you would otherwise have to sling over your shoulder. 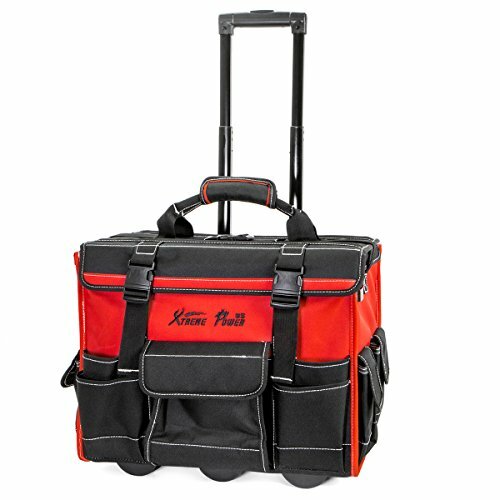 If you need ample tool storage that is mobile and ideal for on the go, the XtremepowerUS 18" Rolling Tool Bag might just be right for you. Well, to be fair, in the box there is the XtremepowerUS 18" Rolling Tool Bag, but inside that there is nothing. Filling it with tools is up to you to get done! That being said you do get a really nice rolling tool bag that comes in at 18" (L) x 10" (W) x 15" (H). 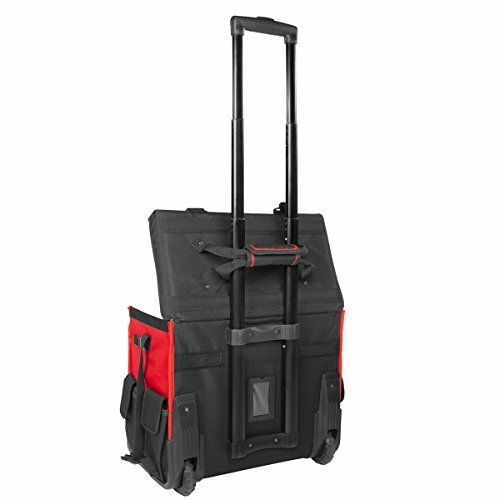 It has got a convenient extending handle, durable wheels, and a whole lot of pockets for all of your tools and accessories. In case it makes a difference, the bag itself is red and black. The XtremepowerUS 18" Rolling Tool Bag is fairly large. Like we said before, it is 18" (L) x 10" (W) x 15" (H) in size, making it ideal for most handymen and carpenters. It is more than large enough for pretty much any of the tools that you are going to need during the day. 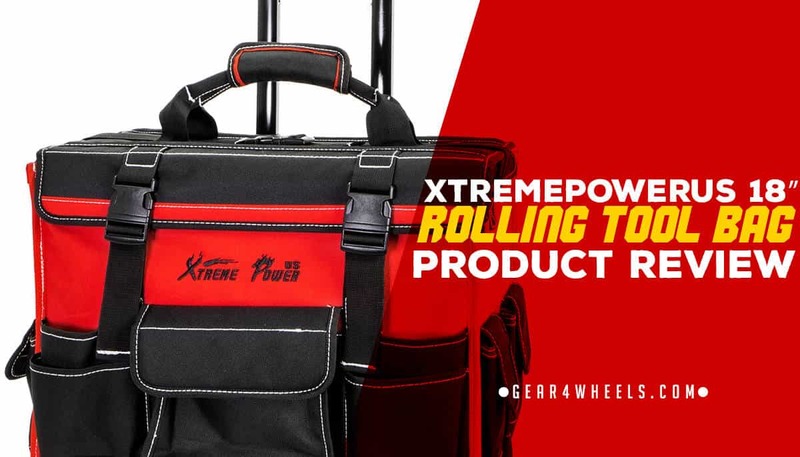 When it comes to a tool bag, being able to roll it on the ground like a suitcase is always convenient, which is exactly what the XtremepowerUS 18" Rolling Tool Bag allows for. It has a set of really durable wheels that have an easy time rolling over pretty much everything in their path. It also comes with a 17.5 inch telescopic handle that can be extended when it comes time to be on the move. Simply push it back in when you don’t need the handle. The XtremepowerUS 18" Rolling Tool Bag is made with super tough water resistant polyester. Your tools are not going to poke holes through to the outside of it, and water is not going to make its way in. Also, the hard lining of this tool bag adds some added protection for your tools on the inside. 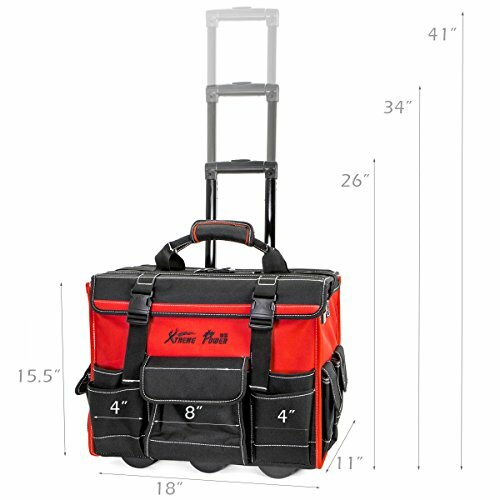 Speaking of your tools, the XtremepowerUS 18" Rolling Tool Bag comes with 9 external pockets and 10 internal pockets to fit everything you need for a long day on the jobsite. It features a wide mouth opening with dual zippers for easy access to all of the tools on the inside of the bag. It even comes with safety straps to keep everything exactly where it is supposed to be while you move around. All in all, the XtremepowerUS 18" Rolling Tool Bag is a really good option to go with for a variety of reasons. It may have a couple of drawbacks related to the interior pockets and their size, but other than that, it really is a solid choice.